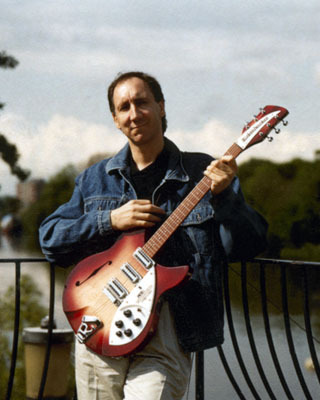 SANTA ANA, CALIFORNIA (June 1, 1987)-Rickenbacker International Corporation announces the acceptance of orders for the PETE TOWNSHEND LIMITED EDITION. The instrument is similar to the guitar Pete Townshend used in his "Mod" and "Maximum R & B" days with the WHO during the mid-1960's. The handmade instrument features Rickenbacker's hand-shaped slim" fast action" neck from the 1960's; violin sound hole; 21 frets; small headstock; three vintage pickups; Rosewood fingerboard; semi-hollow body and neck made from solid Maple; plus, Rickenbacker's exclusive dual truss rod system. The necks are hand-shaped by the same craftsmen that built the originals in the1960's. The Company is authorized to manufacture 250 of these instruments. The guitars will be individually numbered and accompanied by a Certificate of Authenticity and Origin hand signed by Rickenbacker President, Mr. John Hall [now Chairman and Chief Executive officer]. The Company will officially introduce the instrument at the 1987 Summer NAMM show in June. The list price is $1225 with a custom hardshell case at $129. Instrument numbers will be assigned as the orders are received.